Although the TVR Tuscan V8 sports car made little, if any, progress in the US, in terms of sales, TVR management felt there was indeed a US market for a version of the Vixen that offered more attractive performance. With this in mind, a variant of the Tuscan V8 was introduced. However, whilst undergoing testing prior to a launch in the US, it was found that the Ford V6 engine that was to be used instead of the 289 Ford V8 could not, in fact, be used in cars exported to the US since it was unable to pass the stringent US emission control regulations. 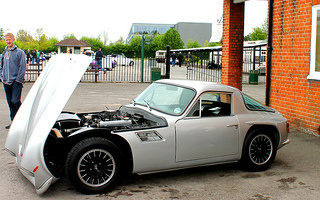 Undaunted, TVR decided that what was needed was a model that bridged the gap between the power of the Tuscan V8 and the economy of the TVR Vixen, which was powered by a 1599 cc, 4-cylinder, Ford Kent engine, as used in the Ford Cortina saloon. Hence, in 1969, and following calls for a more economical engine than the V8, the Tuscan V6 was introduced. Essentially, it was a Vixen fitted with a 2994 cc, overhead valve, Ford Essex V6 unit, and a four speed gearbox, as used in the Ford Capri, Zodiac, and Zephry saloons. With a compression ratio of 8.9:1, and fitted with a single Webber twin choke carburettor, it developed 136 bhp at 5000 rpm, and 192 ft/lbs of torque at 3000 rpm. 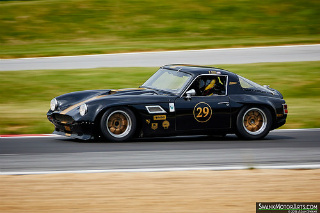 This produced a 0-60 mph time of 8.3 secs, a standing quarter mile time of 16.2 secs, and a top speed of 125 mph. Unquestionably, such performance was a far cry from the Vixen, which produced 88 bhp, and only 96 ft/lbs of torque, with a 0-60 mph time of 10.5 secs, and a top speed of 109 mph. The Tuscan V6 inherited the Vixen's independent suspension all round, a tubular backbone chassis, and a storage area in the rear that was virtually inaccessible. Unfortunately, the V6 didn't sell in the numbers that it deserved, even though it returned a very favourable fuel consumption of 28 mpg. Production ended in early 1971 with only 101 units being built, of which most were sold in the UK. Of the two Tuscan models, the V6 variant was the more popular, although only a few were exported to the US. 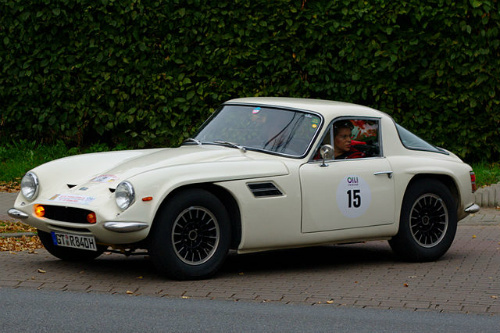 The Tuscan V6 was replaced by the TVR Vixen fitted with a 2498 cc, 6-cylinder engine, as used in the Triumph TR6.